The Computer History Museum in Mountain View, California, is not just a museum of hardware, but also of software. The Museum has made public such gems as the source code for MacPaint, Photoshop, and APL, and now code from the Apple II. As their site reports: 'With thanks to Paul Laughton, in collaboration with Dr. Bruce Damer, founder and curator of the Digibarn Computer Museum, and with the permission of Apple Inc., we are pleased to make available the 1978 source code of Apple II DOS for non-commercial use. This material is Copyright © 1978 Apple Inc., and may not be reproduced without permission from Apple.'" NeoGPC v1.1 is released. NeoGPC is a NeoGeo Pocket Color emulator with the intention of becoming accurate enough to emulate the NGPC bios and properly run all games and homebrew. NeoGPC will also include a debugger with breakpoints and all of the necessary pieces to accurately create NGPC homebrew. 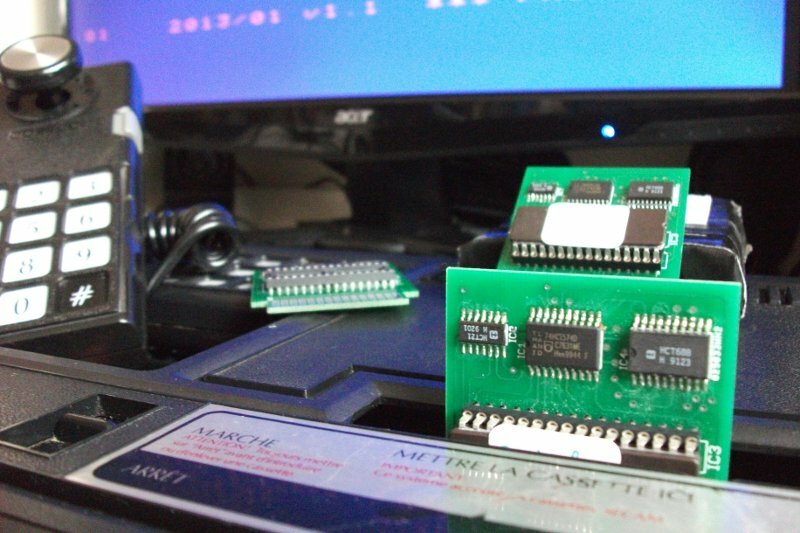 - The TLCS900h debugger is in a semi-working state, so I thought I'd release something. - Breakpoints, stepping into opcodes, watching registers, etc. all seem to be working fine. - Lots of improvement to be made, but its starting to come together. In search of another game to translate, Zynk has found a very, very obscure game from the Mappy series, Mappy Kids. The game is very simplistic in terms of graphics & gameplay, which deviates from the original Mappy game. Mappy Kids–unlike another Mappy game title called Mappy Land–doesn’t involve trampolines. Anyways, while very simplistic, Zynk thought this needed translation as he tried out the game, what confuses him about it is the bonus games. There are three bonus games: a flag game, sumo-like game & a spot-the-difference game. The latter two games are easy to understand but the flag game. The flag game is like a Simon says game where you need to raise or lower colored flags. At first, that game requires mere luck on which flag to move, but after Zynk edited the graphics, then it was easier to tell which flag to move. The location of the texts are somewhat mess out. A lot of repeated names are scattered. With the shop item names, its so cramped that squishy tiles are implemented. Aside from translation, as Zynk beta tested the game, he found a lot graphical errors in the game. Why does such a game as this get campy graphics? Also the background has messed up tile locations that he can’t fix. Plus, the most graphical mishap this game had is the Elephant. His trunk was cut off in-game while the ROM’s CHR had it whole! That was easily fixed & the Elephant has his nose whole. Another one is Goro (aka Nyamco). He has his whisker in an odd pattern that can be easily spotted on the sumo game while he jiggles his stuff. He got a face lift after that. This poor game didn’t get much love by Namco in Zynk’s opinion. It could have better graphics since it was published late 1980s. Namco could have added the trampoline mechanics per title suggests. In conclusion, the game is finally translated. There are other texts that maybe unused were translated, but Zynk doesn’t have the energy to find those after play-testing it multiple times (even on two-player mode). If ever there were errors found, please report it here on the news topic. That’s all! Retrogaming Times Monthly #114 is available. RTM is a retro magazine, sometimes with focus on the homebrew scene. * Des Gamer – Fanboyism, And The 16-Bit Console Wars Part 8: The Wrap Up! Sorry about the long wait, been pretty busy for a while. Did a whole bunch of internal changes. The player won’t notice most of them. However they are required to get the larger bosses on the screen. A new crazy bug was added, when you touch the mummy, you’re character sprite is garbled. It can be fixed by attacking a different creature. 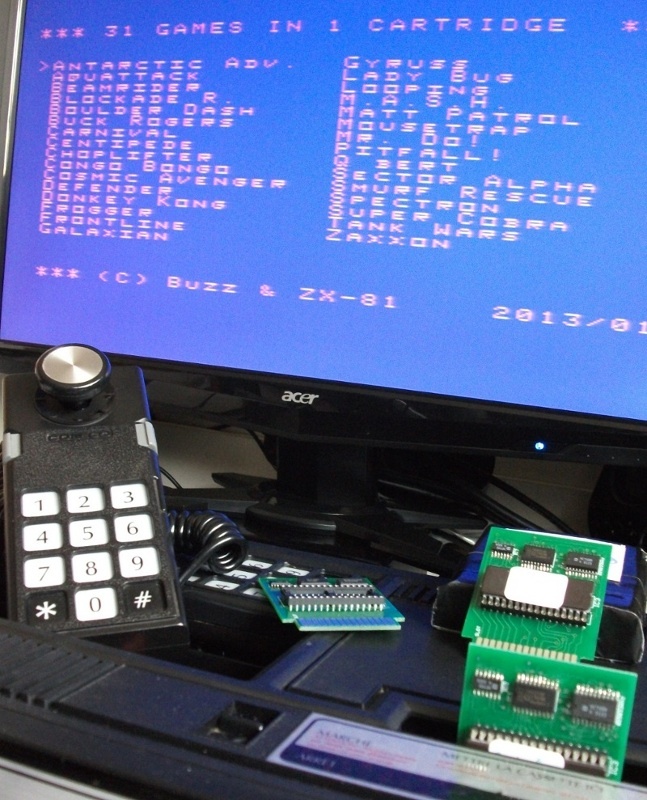 Few months ago, with my good friend Buzz, we had launched the production of few pcbs for the Colecovision 31in1. There are only 6 cards remaining today ! As we read [Adam]‘s writeup for an extremely tiny video game system through coke bottle glasses, we’re reminded of the countless times we were told that sitting, ‘too close to the Nintendo’ would ruin our eyes. We’ll happily dismiss any article from a medical journal that says there was any truth to that statement, but [Adam]‘s tiny video game system will most certainly hurt your eyes. A few years ago, Atari sold keychain-sized joysticks that contained classics such asPong, Breakout, Centipede, and Asteroids. [Adam] apparently ran into a cache of these cool classic baubles and immediately thought of turning them into a stand-alone video game system. For the display, [Adam] used a CRT module from an old Sony Handicam. 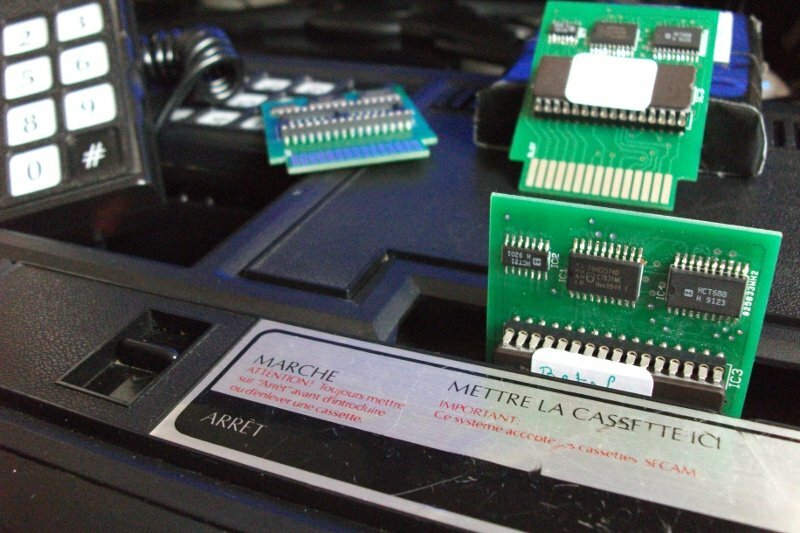 These modules had the right connections – power, ground, and composite video input – to connect directly to the Atari keychain games. The result is a video game that’s even smaller than a postage stamp. The picture above shows the tiny CRT next to a 25mm postage stamp; it’s small by any measure. It’s already pretty cool that [Clay] co-owns an Arcade, but he’s really impressed us with hiscustom-made Splatterhouse cabinet built to get his patrons in the Halloween spirit! A Namco brawler title from 1988, Splatterhouse came in an unadorned and otherwise forgettable cabinet. [Clay] salvaged an old Williams Defender, coating the sides with a cocktail of drywall compound, sand, and paint to achieve a stone texture. He then carved up some pink insulation foam into a tattered “wooden” frame and used it as a monitor bezel. For accents, he fashioned strips of latex to resemble torn flesh and placed them among the boards. The control panel is yet another work of art: [Clay] 3D printed a life-size human femur for the game’s joystick, and converted the buttons to look like eyeballs. The Katamari Prince has been set out to roll up objects and make new planets for the Katamari King who’m feels lonely in the empty universe, the impatient and unhappy Katamari King can’t wait, you have to do it now! Right away! And since the Katamari King is so sad the Katamari Prince is forced to play the Katamari King’s favorite game – Dodge the lightnings. So set out, dear Katamari Prince, make the Katamari King happy! This game by Rabbit 2600 is still in development, motivate the coder so he goes on with his nice work! ChipOff by Random Terrain is a simple breakout-style program that uses the joystick instead of the paddles to chip off the old blocks. When the program starts, move the joystick left or right to choose between 3 ball sizes. Press up for the regular paddle and down for the larger paddle. Press the fire button to start. Yet another Snake game for the Atari VCS. mad4j comes up with Ms. Snake! The international non-profit just for fun game development group Retroguru is looking for helping hands! Several of their games such as Giana’s Return, Sqrxz, Sqrxz 2 and Sqrxz 3 were ported to several oldschool (but also newschool) consoles, handhelds and computers. Still they suffer to find a helping hand to support them with homebrew Wii development. Certainly they will be also happy if you can code for other systems not yet supported such as PSX or PS2, Haiku, BeOS, etc… Most up to date engine is used in Sqrxz 3 available for 18 systems! Main code was usually done by Thor using C/SDL 1.2. As there is no budget existing and most of the team just do games as hobby there is unfortunately no more involved than credits and fame. If you are still interested check out the Retroguru’s homepage contact section. Sources are closed source, but will be of course provided once you need them. Stranglehand is an Atari VCS game by theloon. Use Captain Handy’s amazing fist to eliminate his personal demons! If his outstretched hand touches a demon points are awarded. Greater awards are given if the demon is eliminated while the arm matches its color. Demons who touch your arm will do one point of damage to your health. If all six hearts are gone so are you! Only one arm can appear on-screen at a time. Fully retract your arm to enable the opposite appendage. You can change your off-screen arms color by pressing the FIRE button. Occasionally a star will appear that randomly changes your current arms color and awards bonus points. At certain intervals the demons will begin to move faster. Here comes a PC Engine Invitro called Datastorm 2014 Invitation for Datastorm 2014, made by Up Rough. A few months ago, [Josh] was given an old Commodore 64. He needed to make an AV cable and find a new power supply, and even after testing these new parts out, [Josh] found it still wouldn’t boot. 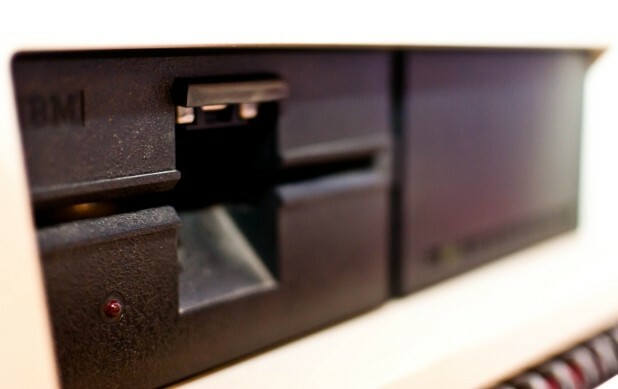 Not one to look a gift horse in the mouth — or perhaps he enjoys the challenge – he set out on restoring a thirty year old circuit board.